very confusing, the inside door signage has 39psi front 47psi rear, the inside gaz cover signage has 32psi all around, any thoughts on why they are different and which one to follow. Wow, that's interesting, I have to check my GL350 now. Maybe the 3rd option would be to see what pressure they have by checking the TPMS? Sounds like the two postings are NOT talking about the same tires! 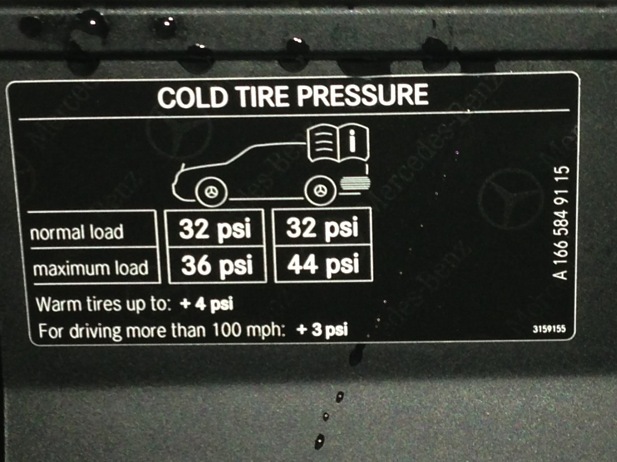 The higher pressures would be for lower profile 20+ in tires. The GL ( all models) can handle anything from 18 to...what is the upper limit on the 550 21 or 22? One of those stickers relates to the tires you actually have on the vehicle! Forget the pillar pressure markings/decal they are nonsensical in all MB models. Inside fuel filler door are the accurate factory "recommendations" for your specific model and tire set- however I recommend you start at +4lb PSI - run for a full week, then reduce by 2lbs and try that for a week - then decide which direction you prefer and go from there. The TPMS is very sensitive so it can react quickly to a drop in pressure - so as a result TPMS is also sensitive to temperature/pressure changes - so too sensitive for general tire pressure setting/work - hope I have expressed myself well on that. 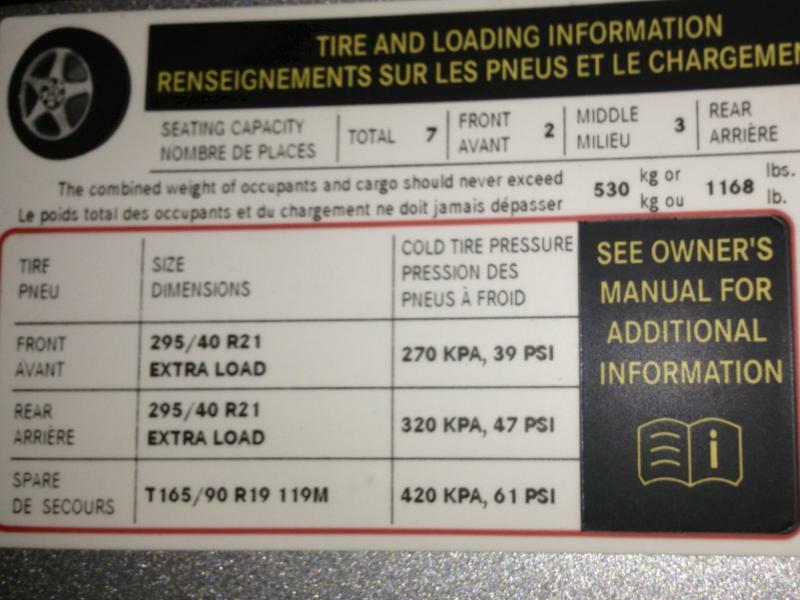 the pressures mentioned are for the same rims and tires- normal load is 32-33psi and for heavy loads or for driving around or over 100mph you need to add more air- which is where the 47psi is recommended..
Let me say this again - for all MB US models - fuel filler door pressures have meaning - pillar pressures are nonsensical..
i thought the same thing with my 2013 GL550.. Still don't know what the right pressure is??? There is no "right" pressure. Tire pressure is always a compromise. I have the 19" wheels and use 33 all around COLD. When driving for 30 minutes or so, during this time of year (it's COLD out) they are running at 35. I did this based on a light load (just front passengers) and the gas filler door suggestions. I may boost it a bit to 36 cold in the rear, but that will be about as high as I go. That will be to accommodate four passengers. To me, the important thing is to not have pressure below 32 and to have it balanced. OH, let me add: I am about to put 18" wheels with SNOW tires on the car next week. I will run those at 32 all around. can you put 18's on? I thought you cant go lower than 19's? Lower air does not increase traction. Lower air increases chance of hydroplaning, and increases tread flex lowering cornering traction. About the only improvement from lower pressure is ride quality. At one point, 18" was standard. But, everybody wants the low profile look. With snows, a taller and narrower tire is better. Went with an 18X8 Falken wheel with a 265/60R18 Falken Eurowinter HS449. 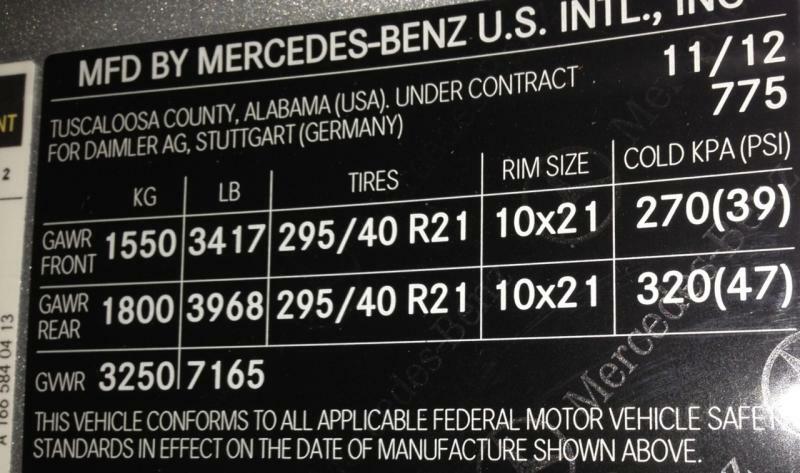 This is almost exactly the same as the size you have when you buy the 19" wheels with the standard Conti factory tires. Basically, a smaller wheel and a taller tire. Speed readings should be about the same. I have the 19" wheels that came with the vehicle as I like the ride over what you get with the 20 or 21 inch wheels. I am not as concerned over the look as I am getting a ride that I like. Everyone has their own preferences and it seems that is why there are so many options. Last edited by Steve Maislin; 01-01-2013 at 05:39 PM. 18" wheels are a bad idea. Don't go with 18" wheels. They won't fit the front due to the size of the calipers. I had a fun day wasting my time trying to install them. I thought so lol ! 18 was standard on 2008. I have the Datacard to show that is how the one I am buying is equipped. Last edited by N_Jay; 01-05-2013 at 08:48 AM. Reason: DUH! Me! Yep, 18" used to be the standard. Yes, it was standard at one time on the X164. Now, on the X166 model 19" is the smallest wheel due to front brake caliper size. That is why I tried it and it was a dumb idea for the 2013 GL. Thanks for sharing so the rest of us avoid that mistake. 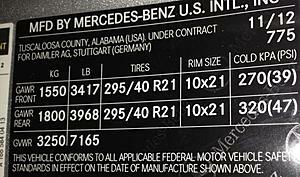 Why take the gas door versus the pillar labels, especially when the pillar directly lists the specific tire specs? my GL550 just started saying "correct tire pressure" on the display when turning the car off. 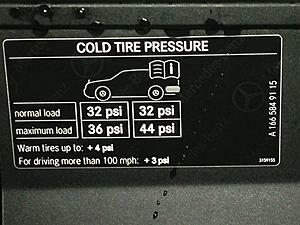 it displayed anywhere from 31-33 psi for the four tires. if i use the gas cap recommendation, then i shouldn't have had to pump any air and the display would continue coming on. so i filled them to the pillar recommendation for front/back, which seems high, but the car is riding fine and if anything i hope to get a little better mpg. this is the first time since taking delivery on 5/11/13 that i've filled any air.